Worship at Shadyside offers spiritual refreshment in a traditional liturgical setting. When the church gathers for worship, it renews its identity in Christ, and we are reconciled to God and to our neighbor. As we hear the Word of God through Scripture and sermons, we are reminded of the love of God and the grace we have received through Jesus Christ. We reflect upon how we each are called to serve God and our neighbor in our daily lives, and we are reinvigorated to pursue that calling faithfully and joyfully. 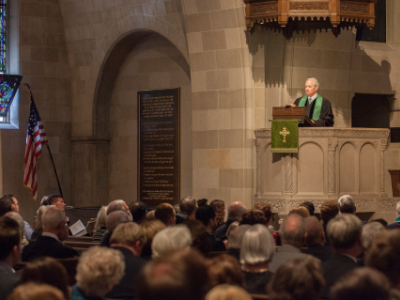 Shadyside Presbyterian Church has enjoyed a history of excellent preachers who have proclaimed the Good News from our pulpit. Likewise, our congregation has upheld a standard of excellence in proclaiming the Good News through song by supporting and developing a robust and refined music ministry. We extend the proclamation of the Gospel in both of these forms – preaching and music – beyond the confines of our sanctuary by making use of webcasting and podcasting via the Internet, as well as the distribution of compact disc recordings. We hope you’ll consider joining us to experience worship at Shadyside yourself – or, if you are unable to join us in person, we hope you’ll participate through one of these alternative means.